Right click here and select "save as" for "King Sultan", a bonus track in MP3 format from our new release "we're God". 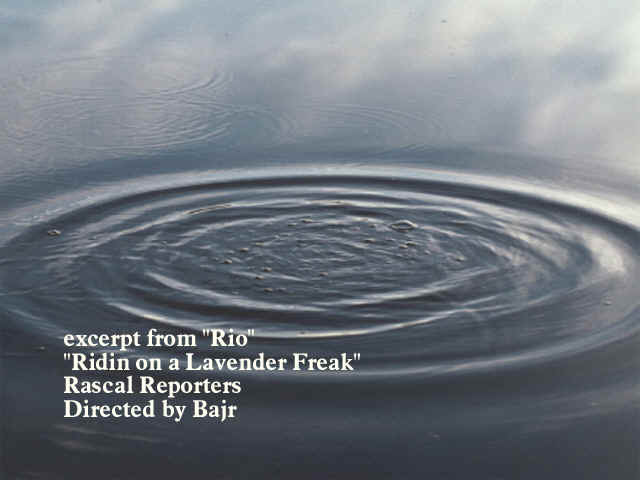 The following is an excerpt from the song "Rio" off the the Rascal Reporters "Ridin on a Lavender Freak" CD. The video reflects Steve Gore's paranoia on what might become of the Clinton-Lewinski issue. This is Alonesoul Productions second Rascal Reporters video, first available for free on the web. We have kept the music high quality (44Khz - 16bit) but reduced the image size so the download will not take too long. It is in Microsoft AVI format with ADPCM audio compression. To get to the music video right click here and "save as" to download.